In 1910, after just eight years since it's genesis, the organisers of the Tour de France first took its competitors to the high mountains of the Pyrenees. One stage that year stood out above all the rest though, a stage of legends, of valour, suffering and defeat. Étape 10 ran from Luchon in the heart of the Pyrenees to Bayonne on the Biscay coast. Covering 326km, the route took the competitors over everything the high mountains could offer; Peyresourde, Aspin, Soulor and the Aubisque. However, towering above them all was the Col du Tourmalet; a mountain which stills fear into many cyclists legs, and the highest Col in the Pyrenees mountain range. Last year I crossed the Col d'Aubisque and the Tourmalet on a fully loaded touring bike. However, that was on separate days and with a triple chainset and mountain bike cassette. They are stunning climbs, not just in terms of the views, but also the technicality of the descents and the severity of the ascents. 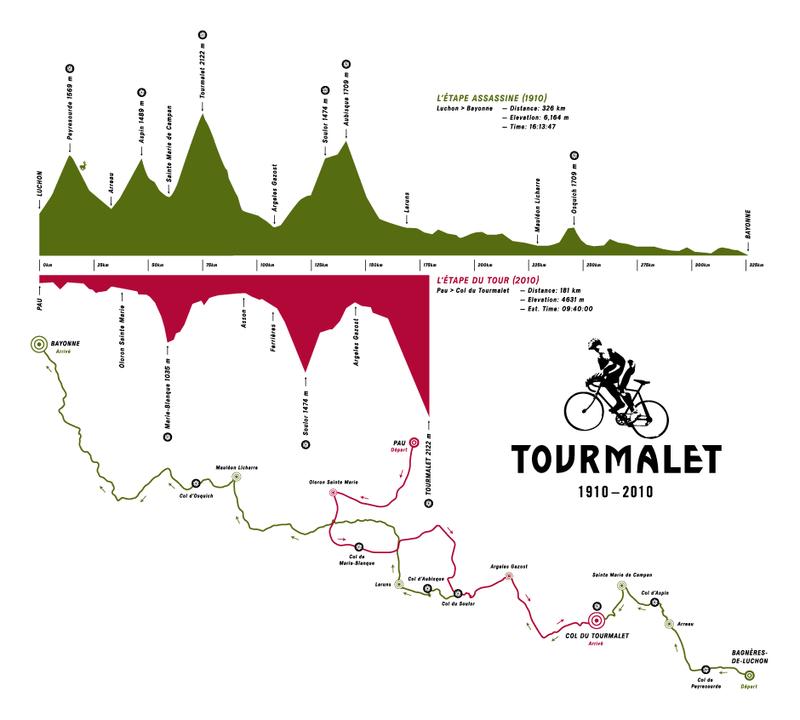 The Tourmalet stands at 2115 meters, and from the Luz-Saint-Sauveur approach that I took last year is 18.3km long, rising 1,450m with gradients of 7-8%. From the East and Sainte-Marie de Campan the climb is 17.4km long and a 1,500m rise, with gradients of 9-10% in the last 8km. It truly is the stuff of legends, I was lucky to pass it on a rare blue-bird day, but most of the time it is submersed in the cloud, with the lone silver cyclist rising out of the mist as you reach the summit. "It was one Alphonse Steinès that first suggested sending the peloton up the Tourmalet’s mighty flanks. A loyal lieutenant to Tour founder Henri Desgrange, it was Steinès who, in January of 1910, led a reconnaissance of the great mountain." "Steinès’ notebooks recounting his experiences during those early Tours are currently on display at Rapha Cycle Club in London. One thing they don’t record is the reaction of Desgrange when the Tourmalet was first mooted for inclusion in the race – Steinès was clearly insane. In the absence of anything that might reasonably be called a road, asking riders to negotiate a route that in places was little more than a donkey track was madness." "Steinès vertical ambitions for the race meant he would eventually become known as ‘the father of the mountains’. Yet it was another key figure in Tour history who would become synonymous with the climb that is now the most visited in the history of the race (of 97 Tours, including 2010, the Tourmalet has featured in 85)." "France’s Octave Lapize had won a bronze medal in the men’s 100km track event at the 1908 London Olympics, following it with victory at Paris-Roubaix a year later. 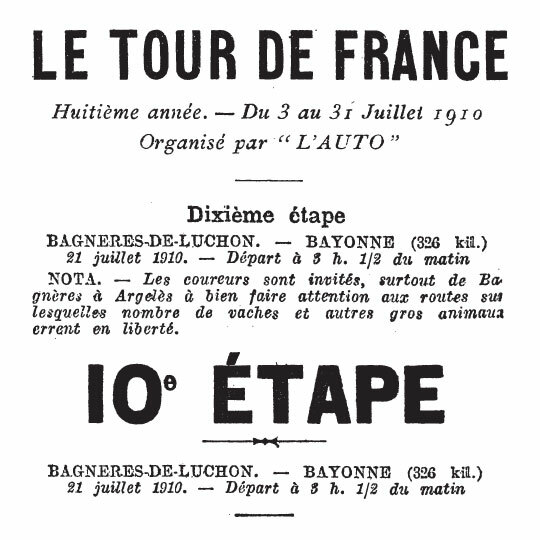 In the Tour of 1909, managing just a second place on Stage 2, Lapize had abandoned due to bad weather. The eventual winner, Luxembourg’s Francois Faber, joined him a year later on the start line in Paris, part of a much fancied Alcyon team. It was Faber who notched up the early successes, winning both Stage 2 and Stage 4. Then, on 21st July, the peloton set out from Luchon, the start of 14 hours in the saddle and a stage that would cement the Tourmalet’s place in Tour history. Hauling their 15kg bikes up the mountain, the rough, pitted roads meant the riders were frequently reduced to a walk." "At the top of the Aubisque, Desgrange and the other officials awaited the first riders. It was Lapize who emerged first, his face a perfect rictus of agony. On the stage’s final climb and with the pain of the Tourmalet still in his legs, it was at that moment that Lapize uttered the words for which he would become famous: “Vous êtes des assassins!” – ‘You are murderers’." "Other riders would come to be associated with the Tourmalet and for a variety of reasons; from the ingenuity of Eugene Christophe to the assuredness and dominance of Federico Bahamontes. 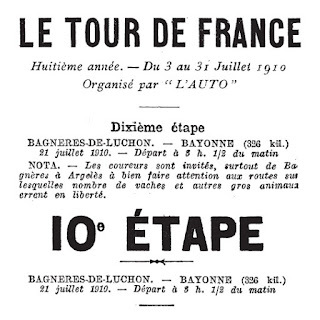 But it is Octave Lapize and that brief, pained exclamation that best sums up the unique challenge the Tourmalet has presented for the past 100 years. It is Octave Lapize (the silver cyclist) whose statue, every summer, is ceremoniously reinstated at the mountain’s summit." OK, so I'm a masochist of one of the highest orders to even consider doing this route, but there is something deep down that draws me to it. It is more than any other stage in the Tour de France, the route map above demonstrates compared to the 2010 L'Étape Du Tour the stage is a beast - almost twice as long and with near 50% more elevation to be climbed. In the style of Marks and Spencer "This is more than a sportive - this is an suicidal sportive". Yes I could go and ride the Marmotte, or the Étape, and I'm sure it would be one hell of a challenge, but the 1910 Challenge instils fear into me every time I think about it. It's a piece of cycling history, a monumental challenge, and for that reason I can't stop thinking about it. So next summer, when I've got a van, a driver and A LOT more miles in my legs I hope to attempt it. What doesn't kill you only makes you stronger...right?! So...who wants to come with me? shot. gun - looks epic!! Chapeaux to those in the Rapha video, which was entralling. And, of course, to you for your idea, once you bring it off. Enjoy summer; it's cooler and wetter in the Antipodes.